A WELL respected former auctioneer has been honoured with a lifetime achievement award. 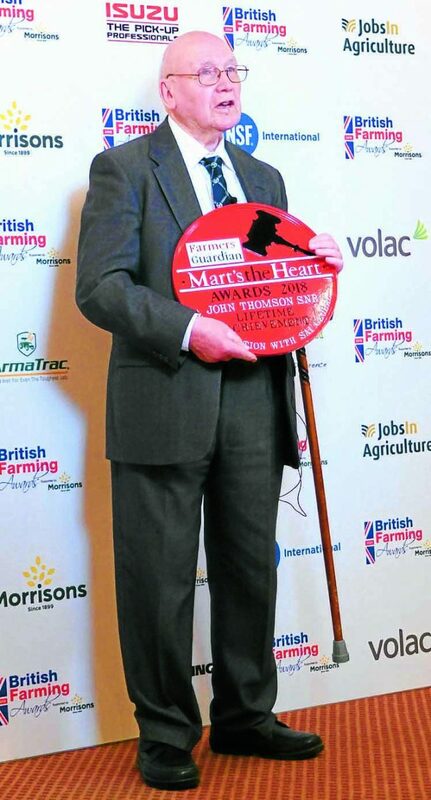 John Thomson Snr, of Annan, received the prestigious Auctioneers Lifetime Achievement Award at the Farmers Guardian Mart’s The Heart Awards in Birmingham last Thursday night. And it was a double celebration as he turned 94 the following day. Mr Thomson spent 55 years as a livestock auctioneer with Thomson, Roddick and Laurie, working in the company’s busy marts at Annan, Dumfries and Thornhill and selling thousands of pigs, sheep and cattle during his career. He was the third generation of his family in the role and his grandson Matthew is today still carrying on the tradition. Retirement came in 2000 when the firm joined with Longtown Mart and he turned his hand instead to writing books – his latest on the markets of Yorkshire, Cumbria and Lancashire is due out in the new year.